If You Believe in Prayer, Then Please Pray! Hey everyone. I thought long and hard about whether to do this post. Unless I'm sharing something cute and fun about our grandchildren, I tend to be very private. I thought about how grateful it makes me feel when I can offer some little bit of hope and tender words when one of you asks, and felt it was selfish not to give you the same chance. You are all such wonderful people, and I truly feel you are my friends; and sometimes we just need to know that our friends are thinking about us. It seems 2015 has really tested our strength with sadness & sorrow. We've lost two very good friends, & a cousin who was also a friend. We are now faced with the heartache of losing my hubby's sister, Carol and my dear sister-inlaw. She has battled the demon cancer for over four years and has reached that point where there is nothing left to do. Hospice will be taking over her care this next week, and we will be seeing her in a few days. My hubby is devastated. He and Carol have always had a close bond that has only intensified as they have each gotten older. For me, she has always been the sister I didn't have. She has an amazing countenance and says she is ready and at peace with what comes next. None of the rest of us have found that peace yet. She has been married for almost fifty years, and her husband is a kind and gentle man. She has three grown children and four grandchildren. She has three siblings, their spouses and countless friends who will miss her so much. If you do believe in prayer, then I ask you to pray that Carol does not suffer. I hope you will pray for those of us who will be left behind, that we can be strong for her as she bids us goodbye. I hope you will pray that we can all draw upon some of the strength Carol has always had, and make this stage easier for her. Hey everyone! 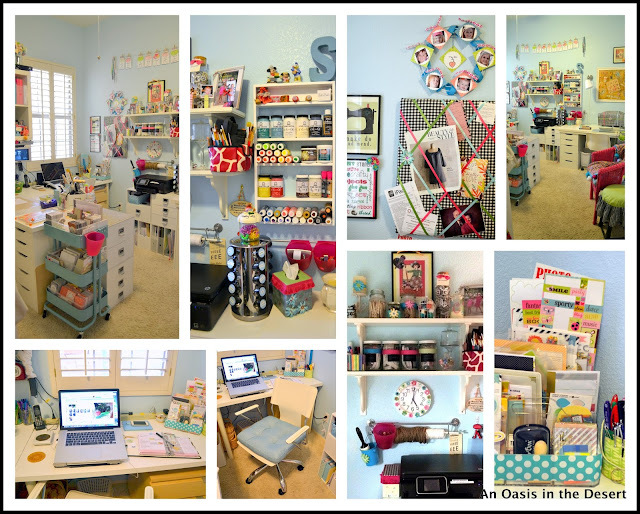 I'm so excited to do this post, because I'm joining a bunch of other bloggers who will be sharing their creative spaces. Karen Valentine of My Desert Cottage is the genius behind this super-fun event. This is the 7th year she has put this together, but this is my first time! 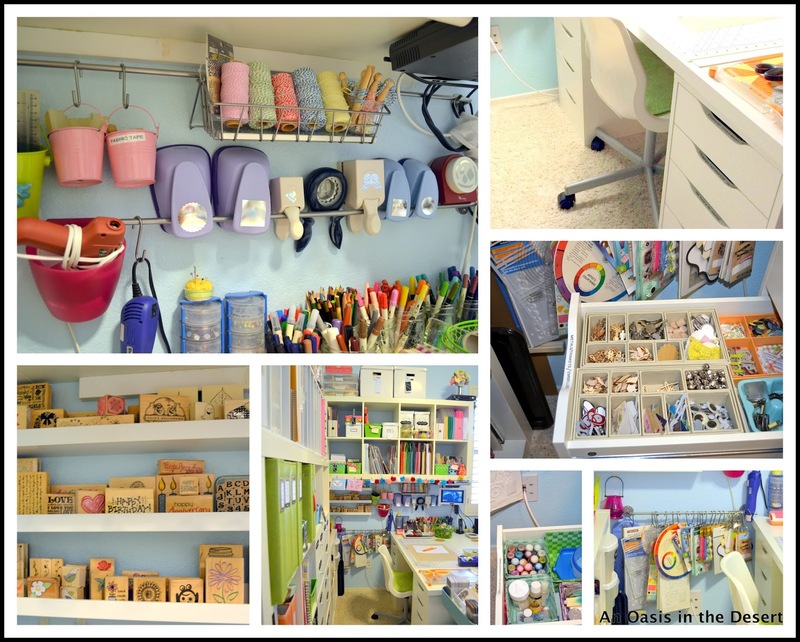 If you've got a creative space you would like to share, come on and join the fun! The link is below. "My Happy Place" and do exactly what I wanted to do with it. I've had a love affair with the many shades of turquoise and knew that would be the wall color. It is called "Surfer" by Behr. I also knew I wanted white furniture, so IKEA and I became BFF's. My room is 10'x12', not very big, but I have utilized every square inch. I'm a very visual person when it comes to creating and like having most of my tools and supplies visible. I also love doing all kinds of things -- crafting, scrapbooking, card making, sewing, quilting, and just a bit of jewelry-making. Oh, and the other thing you should know about me, I'm rather new to photography and take tons of photos. So, now you've been warned! I am so excited to welcome you to my craft room, aka "My Happy Place!" I have this little room divided into zones. This first collage is my "Sewing Zone." 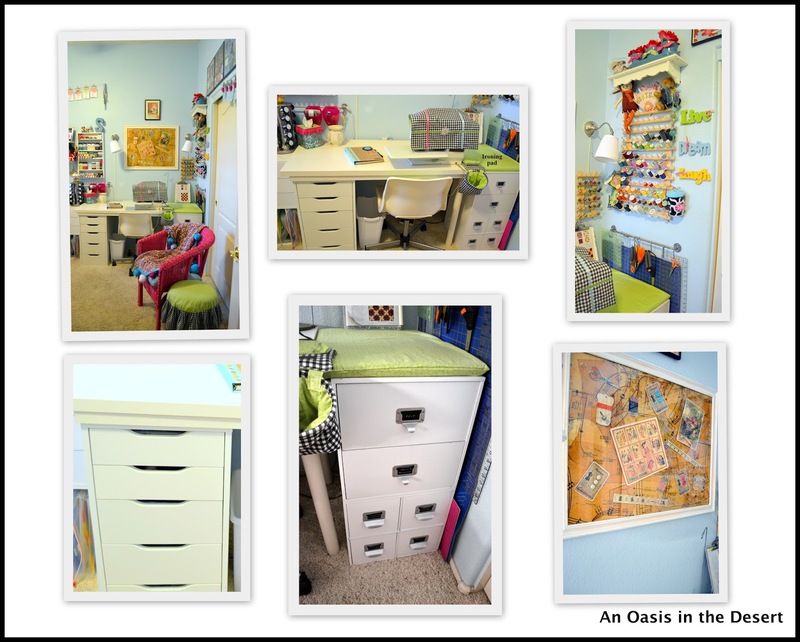 I've used the Alex drawers & Linnmon table top from IKEA for the base of my sewing table, and have also added two of the Recollections cube storage from Michael's. The art piece over my table was my first attempt at mixed media. I mod podged some old pattern pieces to foam core & then added in some button cards & a few other things that I just printed off the internet. Okay, this is where some of you might feel a bit dizzy! As we move to the left of my sewing zone, this is where I have my printer (it's sitting on four of the Recollections cubes), a little rack that holds my paints, some shelves holding all kinds of colorful items, and my computer desk (another IKEA table). I'm using the Heidi Swapp Memory Planner this year (love this planner), so I have an entire divided tray holding all kinds of stickers & cute stuff for my planner. My chair is a new purchase from Costco, and I really like it. This is the only bedroom in our home that has a window facing the street, and I really enjoy being able to see what's going on in my neighborhood.....SNOOPY! This is where I can really make fun-stuff. My table & drawers are from IKEA, of course. I like having my pens and colored pencils in jars, and the pens are sorted by color. I use lots of different brands, so I don't mind having them mixed together. I like my washi tape in the basket, so I can just rummage through. My hubby mounted the Expedit on the wall, and it's so handy. just so cute! I like that I can roll it right up to my chair when I'm scrapbooking. Some more views of where I do most of my playing working, no it's playing! Like I said earlier, I like having my things visible, but I also have lots of drawer storage, and I like having it well organized.......much easier to find and use what I have. A close-up view of the wall-mounted Expedit. I've just recently re-organized this Expedit, adding more of the Recollections cubes on top for scrapbook paper storage. The white bins, boxes and even the four sets of drawers are IKEA-made. Out that door, 3-steps on the left is my kitchen & a few more steps to the right is the pot-tay! This little room is in the perfect location for me. Ribbon in these clear plastic jars works just fine for me. I really like storing my paper vertically, & I have it all labeled so it makes sense to me. 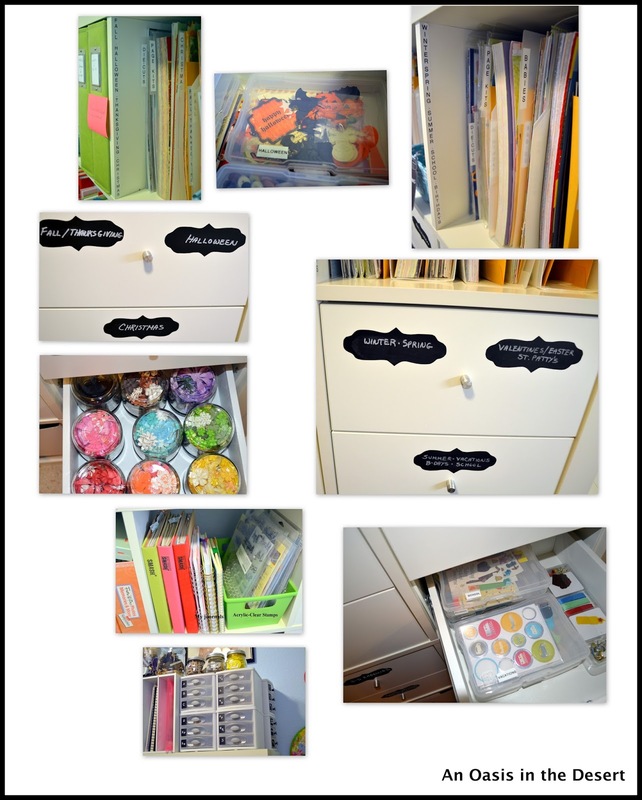 I keep some of my seasonal and specialty paper in cubbies just above drawers that hold the complimentary embellishments. I have my paper sorted & labeled and have also added manila envelopes (tops cut off) to each section for scraps or die cuts. The stacks of little plastic drawers (above--lower left) hold my alphas. My flowers are in clear jars turned upside down in a drawer. I discovered that these 4x6 Iris photo holders are perfect for containing & sorting a lot of my embellishments within the drawers. I also use them for photos. Do you want to see what's behind the closet doors? This left side holds fabrics, patterns, clothing for altering or repurposing, lots of projects in process & some that haven't even been started yet. I have my larger pieces of fabric hanging on children's clothes hanger to the side of the closet. Laces, trims & binding in one set of the 3-drawer units, and quilt fabric that I've already cut into specific strips and squares is in the other unit. Quilting and sewing books reside here as well. I have four of these drawers holding fat quarters, which I like to pick up whenever they are on sale. The rest of the drawers hold quilt backing fabric. This is the "project" side......things that are already cut & in different stages of being finished. This Expedit boxes hold patterns, fringe, drop cloth fabric and clothing to be altered. We have high ceilings throughout our home, so I've used that upper space in the closet to store some of my wreaths. This right side of the closet is more for crafty things. 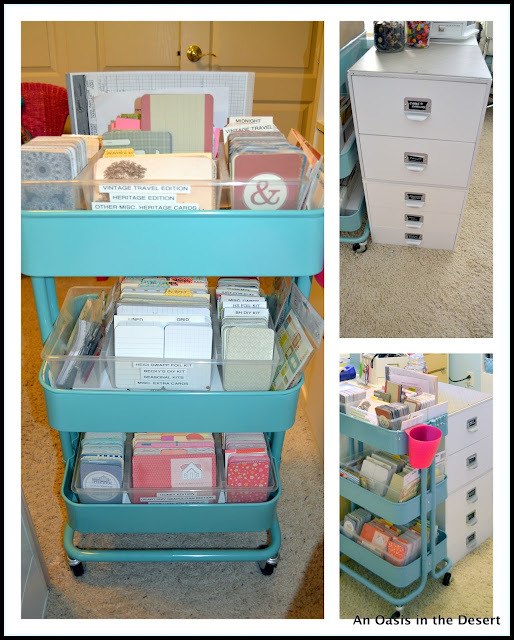 I'm a firm believer that you can never have too many drawers! I use something out of this tool spinner every day......so handy! The paper roll & cutter are from the IKEA, where else! These frames are made to hold finished scrapbook pages, and I have them filled with all my sweeties. On either end is our daughter and son when they were itty-bitty. All the cuties in between are our six grandchildren. Technically, you are supposed to rotate the pages out, but I did these almost four years ago and cannot bear to change them.....I love them so much! "Simplify" was my one word for last year, and I like it right there! My hubby, aka: The Man, just rolls his eyes when he looks at that word. He thinks it should have been "Multiply!" Oh well, he loves me anyway; plus, he has a shop that "over-floweth" with stuff! And this is my hot pink wicker chair (newly painted, again) & soft afghan that would be so comfy to settle into once-in-awhile; but the little fur-baby who rules the roost and allows us to live here, has taken it over. She was just here, but the doorbell rang a few minutes ago & she skidaddled! Nows my chance, because I'm exhausted after editing all these photos.....whew, how about you? If you stuck it out with me, I extend a big "Thank You." I'm so happy you came to visit. 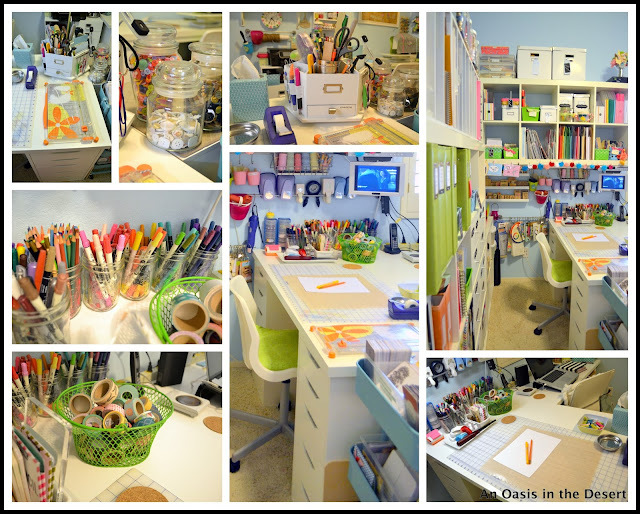 Now, please go visit some of the other bloggers who are sharing their creative spaces! This restaurant is based out of Chicago & began life as a simple hotdog wagon. If you live in the Phoenix area, there is one in Scottsdale & Tempe. They are also in CA, IL, IN & FL in 2016. If you've tried this restaurant, then you know how good it is; if you haven't & there is one anywhere near you, GO.....GO QUICKLY! 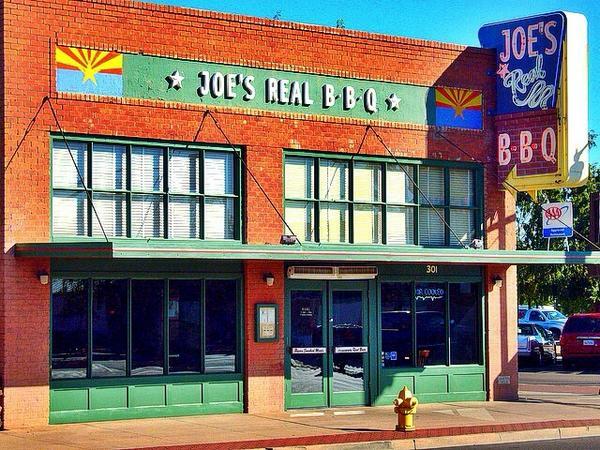 Joe's is located in the Heritage District of Gilbert. They also own Liberty Market which is just across the street, and Joe's Farm Grill (this has been featured on the Food Network). We like them all, but this one is our fave! Okay, I'll get on with sharing a few changes I've made in the kitchen. For summer, I've been using my stand-by favorite color, turquoise, but have also added in some pops of red & yellow. They just say "summer" to me! I first saw this cute print at Lisa's @ Texas Decor and she saw it at Laura's @ Finding Home. Isn't it cute, and it's a FREE download! I added a little border of washi tape in turquoise, of course! 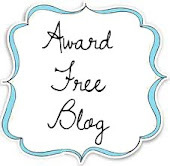 Thank's, Lisa, for sharing this on your blog, and thanks to Laura for the original print! This is where I made several changes. I love this desk-buffet.....it serves so many purposes. I have my cookbooks in the left-hand lower cupboard, but decided I really wanted more of a designated space for looking over menus and planning meals. This is my old laptop that had some of its memory fried, but still works great for Pinterest. With a cupboard full of cookbooks, my go-to search is almost always Pinterest. I do still enjoy having some of our "tried & true" recipes written or printed out, but consolidated a huge 3-ring notebook into this cute 8x8 album. The album and recipe pages are a creation of the very-talented Becky Higgins of Project Life fame. I will do a special post about this and share pics of the cute pages. 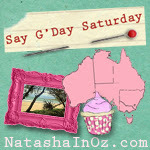 I've got it in my Blog Log coming up soon! Most of the components are the same, but I've changed out some containers. This sugar & creamer are from my great-great grandmother. I've had them for 40+ years, and they've been safely tucked away in my china cabinet all this time. Well, I'm not doing that anymore with anything. I'm on a mission to use everything no matter how sentimental & dear they might be and enjoy each and every piece. I have no idea if these pieces have any monetary value or not. It doesn't matter to me. I'm just enjoying using them and visualizing that sweet farm couple & their children, gathered around the breakfast table with this large cream & sugar sitting somewhere in the middle. As I use them every day, I think about how many hands have touched this set, and it always makes me smile. That's a grasshopper in the design. so much happier and bright. Thank y'all so much for popping in to visit. Remember....you are always welcome here! Hey everyone! Well, July has arrived and the 4th is coming up quickly. I don't do much of any decorating for this holiday, but I am patriotic.....love this country and all the freedoms that we have.....so I fly the flag and pop a few small flags here and there. I was really tempted by all the cool decorations I've been seeing in blogland, but I decided whatever I did, was not going to cost me anything. So.....I shopped my house for anything red & blue to use with some white things I was already using. Like I said, I didn't do much, but I'm pretty happy with what I came up with. I've had this table runner (Pier 1) for years, as well as the placemats -- they do not totally match the runner, but they look good with it! Hmmm.....I guess I should have done place settings with my red, white and blue Fiesta. Oh well, just use your imagination! I made the red & white ticking napkins a couple of years ago and just have them sitting on some very brightly colored salad plates. 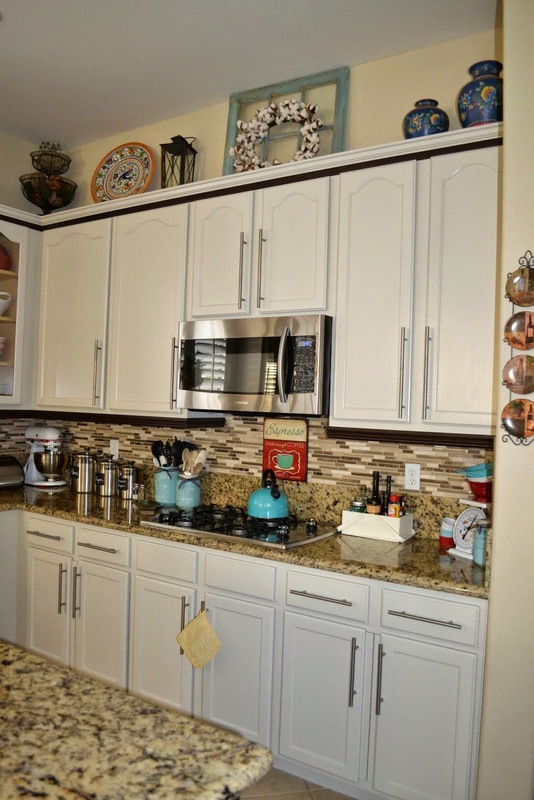 I like the small lantern, & it fits nicely on the lazy susan. I have always liked the stitching and appliqué on this runner. Okay, this is just more about summer! I've switched up some things here in the entry, as well as the sitting room and dining room; but I'm saving that for another post. Here on my entry table, I just used a tiny vase to hold some very small flags. I like how this looks with the greenery. Here is another Pier 1 table runner from years ago. I wasn't sure how I was going to like it in here, because it's not the typical colors I use in this room; but it's growing on me. I like the large glass lanterns on either side of my dough bowl filled with faux peonies. I finally put my cotton boll stems away until Fall and tucked a few flags into one of my white pitchers. I'm pretty much in love with this big old tray holding the white rooster and white pitchers....I may never move it! Last but not least, I grabbed a few faux flowers from my "newly re-organized" decor closet, & added them to this blue & white pottery piece that The Man bought in Spain many, many years ago. The little flag finished it off perfectly. Well, that's the patriotic decor for this year. If I don't have another opportunity to say it, I hope you all have a wonderful and safe 4th of July!